I will be the first to admit that when I pack for a cruise, I pack and repack, and unpack. I make lists, and then I get serious about it and remember all the stuff that we DON’T need and what is in our room. Have you ever wondered what you need to bring with you when you go cruising? We have been on a few cruises before, so I had a pretty good idea of what we did and did not need but if you have not been a cruise before. My OCD takes over and I have to check, recheck, look at old photos and read in info in chat groups to verify everything. Today, I am going to make cruising a lot more easy for you to prepare for with a little insiders information on what is in a Carnival Sunshine Stateroom. There are things you want to know, so you pack less and enjoy more! 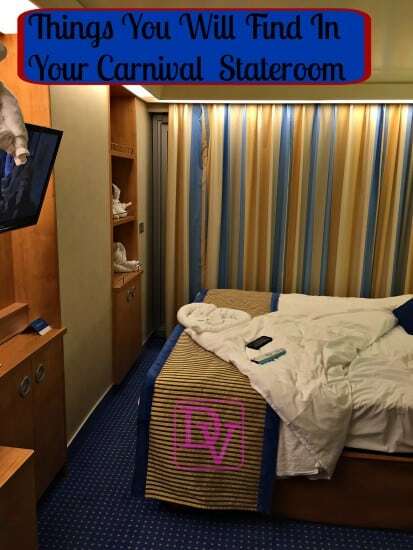 Every cruise line differs with what they offer in your stateroom so make sure you inquire before you go, but if you are setting sail with Carnival Sunshine, I can show you what’s inside the room as we lavishly lived cruising out loud with the Carnival Sunshine. What Is In A Carnival Sunshine Stateroom? My Video has a lot of good information, so watch it once or twice and I am sure you will see things that you don’t need to bring! The closet space was plentiful and there were hangers in the closet, so I did not pack more. There were drawers as well as shelving outside of the closet and we used all of this to stack our clothing as well. 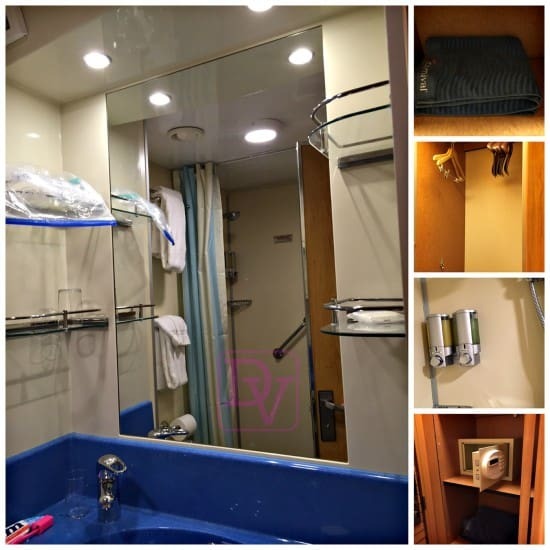 The bathrooms had plenty of space for your toiletries, and we additionally brought along that little item you saw on the door if you watched the video, which keeps you so organized the whole trip and it packs down easy in the luggage. I do believe one of the nicest features was having the bathrobes there, making it easy to just change clothes, balcony hang or transition from shower to room. In addition, the bath gel and shampoo are in dispensers and never in shortage, because your cabin steward makes certain. The ice bucket lets you keep the water chilled and is perfect when you wake up and are in need of a drink (maybe because you drank a bit during the day or just because you are thirsty), it is like an ice machine on call. Packing the basics was all we needed to go, but if you need a few tips for what to pack for those ports of call or just packing for shore excursions in general, make sure to read my other articles that detail this. Lavishly live cruising out loud and don’t overpack as this video details what’s in a Carnival Sunshine Stateroom. What things have you found in your staterooms when cruising? I have always wanted to go on a cruise but never had the means to do so before. It is for sure on my bucket list. This room is amazing and I would so get the sunshine stateroom . Thanks for sharing your room it is totally gorgeous. the hubs and I are looking at cruises so this is great info for me to use to compare rooms and rates! Having been thinking of planning a cruise lately. Will have to keep this info in mind when I do. Thanks! This is awesome! I can live there, I swear. Lol. The cabin is so nice and the bed looks so comfy! Oh how I wish I could go on a cruise vacation right now! The room looks so cozy! I love the balcony. Perfect reading nook! I would like to be on a cruise now as well, get out of this weather! I am still of two minds on this one – whether to add it to my bucket list or not. Will bear your tips in mind if I do. Great post, been looking around at all the cruise holidays available. So much to choose from! I have never been on a cruise, but this is on my bucket list. I want to go on every Cruise Brand, that is my bucket list. Cruises are so much fun! I never been in cruise and i want to experience it. I think its a lot of fun with my family. I really appreciate a closer look as I’ve never been on a cruise before! I surprised my husband with a cruise for his 40th. It was a blast. Put everything in your suitcase. Fill in the hole with money. I have never been on a cruise before but I want to one day! The carnival sunshine cruise sounds like a good one! How fantastic is this showroom it is equipped with everything that you could possibly need. My foster mum has a caravan that she absolutely loves going to every weekend. WOW! That looks NOTHING like the tiny cramped room I had on the one cruise I was ever on. This looks gorgeous! I love the balcony! I’ve never been on a cruise but it looks like a lot of fun! I’ve always wondered what the inside of the rooms looks like. Thanks for sharing! I haven’t been on one for a while, but am including it in my holiday plans! This is lovely! I love the addition of the shower gel and shampoo dispensers. Looks like a lovely way to vacation! I am dying to go on another cruise! I loved the one I went on.